This is the first time a Brett Whiteley exhibition has toured to regional Australia since the Brett Whiteley Studio opened in 1995. The exhibition includes 20 Whiteley works and traces the artist’s life and career from his earliest painting Self Portrait at Sixteen, 1955 to just a few months before his death with Port Douglas, Far North Queensland 1992. Entitled 9 Shades of Whiteley, the exhibition will travel to 6 regional centres across 3 states (NSW, VIC and QLD) over 18 months. The 9 shades include Whiteley’s Early Works, Abstracts, Christie & London Zoo series, Lavender Bay, Portraits, Birds & Landscapes, Sculptures, and Late Works. The final section includes a selection of photographs of the Brett Whiteley Studio, which was Whiteley’s last home and studio from 1985 to 1992 and now a public museum. The Italian Travelling Scholarship, awarded by Sir Russell Drysdale was the first major prize that Whiteley won when he was just 20 years old. Two of the paintings that Whiteley submitted, Sofala 1958 and July painting circa 1959, are included in this exhibition. The Scholarship enabled Whiteley to travel to Europe and experience art as opposed to reproductions. His extended period overseas is represented with several works including Untitled 1961, Chimpanzee 1965 and Small Christie painting no.2 1965. 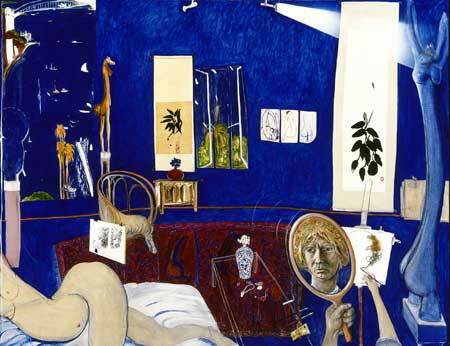 Inspired by Matisse and his superb The Red Studio 1911, Whiteley produced Self- Portrait in the Studio 1976, which went on to win the Archibald prize; preceded by The Balcony 2 1975, where he flattened the picture plane and saturated it with ultra-marine blue, shifting the horizon line beyond the edge and allowed the viewer to experience, with a kind of symphonic expansion, the natural beauty of Sydney harbour, his home. Both works are included. The Art Gallery of NSW manages the Brett Whitley Studio and organised the exhibition together with a comprehensive education program. The program includes a 2-day training course presented by Art Gallery of NSW education staff at the Gold Coast Regional Art Gallery in July and an on-line education kit for regional educators, both museum staff and teachers.